Poinsettia Plants | How to care for and grow Great Poinsettias. 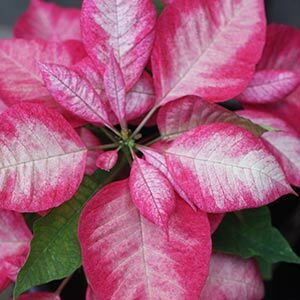 Easy care in a warm part shaded position, the Poinsettia is a colourful foliage plant that commonly appearing at Christmas time. If you thought that all Poinsettia plants had red flowers then think again. Breeders are bringing us more varieties each year, different color combinations to add even more interest to the Christmas plant. Poinsettia, or euphorbia pulcherrima are a traditional christmas gift in both Australia and the Northern Hemisphere, where they flower during winter. They are grown especially for the Christmas market in Australia under controlled conditions. The original Ponsettias were from Mexico, and they reached 2m plus in height. It was in the USA that breeders developed the compact varieties that we see for sale today. Varieties with close to white flower bracts are coming onto the market, as well as types with mottled red and cream foliage. In QLD Poinsettias do well throughout the year. They do not like drafts. They do like lots of filtered light (near a window) humidity if possible and keep moist. Red, Pink and White are the main colours available. They are available for sale from most nurseries and even supermarkets from October onwards. As these are plant that we use indoors for the wonderful ornamental foliage over Christmas, you need to make sure that you choose a plant that will look great over the festive season. A number of pointers will help you select the right plant. This is the same for many plants, make sure you look carefully before you buy, if in doubt look elsewhere. Often seen as a disposable plant, they are hardy and can be encouraged to flower again and even grown on through winter. As the the colourful flower bracts begin to fade after Christmas you can cut the plant back to those boring old green leaves below. It is also time to fertilise the plant and give it some time outdoors. Find a spot where it will get good indirect light, or morning sun only. The plant will begin to send out new shoots, and when winter comes around it may also flower again. You can keep your Poinsettia outside during summer, and you can pinch it back to promote new growth. Poinsettia can be cut back during winter. 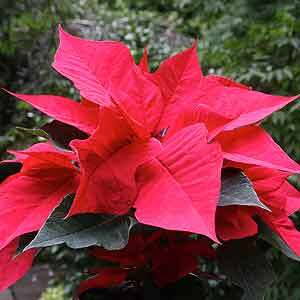 Poinsettia have been grown in the USA since the early 1800s, however only the large plants at this time. First cultivated by the amateur botanist, Physician and Diplomat Mr Joel Poinsett who was the first US Minister to Mexico.